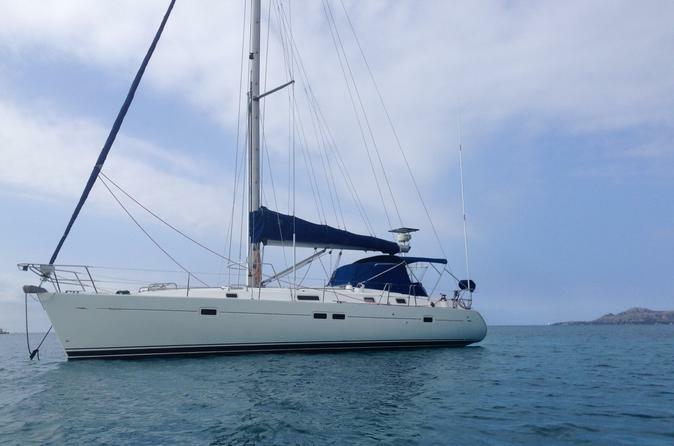 Any occasion is a great one to get out on the water and enjoy some relaxing and refreshing ocean time especially here in Hawaii where the air is balmy and year-round trade winds provide wonderful sailing conditions. As you sail you may see green sea turtles lazing in the sun, dolphins jumping the bow, whales (winter only) spouting off to starboard, the stunning shine of Venus at sunset. Ahoy and thank you for your inquiry. I would love to be a part of your Hawaii vacation and take you sailing. Because this is custom sailing, we can sail any time of day you want and whatever length of time you wish. Our islands are most consistently graced with trade winds so any time of day is a good time to go sailing...morning, afternoon, sunset. It is all good. That being said, sunset cruising is all about kicking back and relaxing, perhaps enjoying a cocktail. I sail with a lighter sail plan than during the day unless otherwise requested. "Kaikiwi" sails from Oahu's south (protected) shore, not far from Waikiki, past beautiful coastline in the cobalt blue blue waters of our Pacific. Wildlife such as green sea turtles, "honu", dolphins, "nai'a", humpback whales, "kohola" (in winter season only), and flying fish, "malolo" are some of the critters we may see as we sail. Beautiful views of Oahu, Diamond Head and, on clear days, far in the distance, Molokai and Lanai can sometimes be seen. Please understand this is not "destination" sailing. "Destination" is sailing. If you need, bring snacks and beverage for your day/evening on the water. Adult beverages are welcomed on board but, please, no red wine. To board and sail on Kaikiwi, all clients must be agile and mobile. Because our exposed coastline is subject to currents (creating a high liability for the captain if swimming is even allowed), has no secluded coves/ lagoons and has unspectacular reef in our sailing area, snorkeling is not offered. While your private charter is primarily a sailing experience, if you would like a swim (you must be a strong swimmer), let me know and, after assessment of conditions, the captain can drop sail while you all jump in the water. We don’t anchor: we drift with the current and a floating tether is attached to the boat. This is a bunch more fun than being anchored. For safety reasons swimming is not an option during a sunset cruise. To help you make the most of your private sailing adventure, please let me know if you have any questions or concerns.